The No.1 Ladies’ Detective Agency is cool for a number of reasons, but the best part about the series is the lead character – Mma. Ramotswe. She is the first really likable detective I’ve come across – unassuming and pleasant; someone you could hang out with, and make easy conversation about Botswanian politics over a cup of tea. No one else comes even close. I’ve heard quite a few people claim that they love Sherlock Holmes, but I am not sure they know what true love means. Holmes, if you recall, was the deductive genius constructed from bones and brain who subsisted on tobacco and said things like “It’s elementary, my dear Watson” (although his handlers now say he was misquoted). Now he is the type of person that inspired awe, not love. He was a skillful detective, who was aware – too aware – of his skill. He was moody and aloof, and seemed to prefer hanging out with dumb doctors. If he were to stop by unannouced at my house one of these days, I’d be leery of letting him in. Not without clearing my list of visited sites, and making sure my shoes were out of eyeshot, with no traces of soil on the soles. I’d make him a generic brand of tea – characterless – and make sure I drink my tea when he is not around. I’d fret about the way I eat my food, and make sure I don’t look at anything on the wall when thinking about stuff – this dude can pick up trains of thought. Thank you very much, but I’d rather watch him drinking tea with you. Miss Marple was possibly a hottie (if and) when she was young, and could sometimes make intuitve leaps that could shame Holmes, but she was boring and mean. She was an anachronism even in her time, and talking to her over tea would be umm.. boring. And there is the small matter of her thinking of us young folks as fools. Perhaps the only thing that would make me do it with her (why do you snicker? I meant the act of drinking tea) is the threat of an evening with Poirot. Uggh. I shudder when I think of the reactions at the restaurant when I walk in with this funnily dressed dude with an upturned moustache. Although I think it would be kinda cool if I take him to the local restaurant that plays “Mangalu Mangalu” all the time. 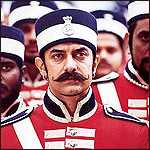 (Alright, Alright that was a lame reference: just because Poirot’s moustache is upturned doesn’t mean he looks as bad as Aamir Khan does in Mangal Pandey). Marlowe? No way. How long can you stand someone wisecracking through the sides of their mouth? And that, by the way, rules out most of the detective populace since Marlowe. Well, maybe young Christopher would fit the bill – we could talk prime numbers and the big bang theory – but he’s a little too young. And coming to think of it, pet detectives don’t count. So no Christopher, and (thank goodness) no Ace Ventura. I read that Miss Marple started off really mean, before Christie started sanitizing her over time. She was pretty grumpy (and gossipy) in her later books, and I shudder to think what she would’ve been before she got sanitized. Mma rules. Thanks for stopping by (and the kind words). her a while ago and loved her ever since. Poirot drinks his tea Chinese… weak and verrrry foreign. That’s the latest I read about his tea drinking habit! Uggh, ‘nother reason to stay off the dude. evanda avan hercule poirot pathi thappa pesinadhu!!! what can i say – i really do love that little baldy, cutey, brainy! Lol- yeah- stay off dudes!!! I am a die-hard Holmes fan, but I agree with you. I’d rather spend an evening with Dr. Watson than Holmes. I love Poirot, but fear he may sneer at my Chai. Anyone who speaks French, or English with a French accent automatically makes me feel like I just moved out Pillayar Palayam (substitute with any other small town / sub-urb in small town in T.Nadu). I’ve always hated Miss. Marple, so the idea of spending any time with her doesn’t remotely appeal. The only Christie characters I hate even more than the Marple woman are Tommy Tuppence! Ughhh! Auguste Dupin (of the Murders in the Rue Morgue) has the same problems as Holmes. Brilliant, but taciturn, if I remember correctly. And worse, this one’s French too! So he’s out. Lord Peter Wimsey is an attractive candidate – being English, and a peer, I feel confident that he may be relied upon to supply the best Darjeeling or Assam tea, and sandwiches with the cucumber slices cut just so, and scones and tea cakes too. But we also run the risk that being English, he might just throw abominations like Earl Gray at me. Gad! Hey, what about Bundle of Christie fame? She comes in Seven dials and one more. Then again Victoria Jones of ‘They came to Baghdad’ was interesting. Chance investigators. But good nevertheless. Tea with them wouldn’t be so bad an affir. Well, Christie did write some amazing mysteries. Poornima, you know your Christie better than me. I confess – I’ve only read a few Poirots and Marples, and I wasn’t that taken in by what I read. There was a lot of hand waving – and Miss Marple always seemed to have something suspiciously like the current mystery happen to her in the past. And Prash, I am kinda scared now. I hope you are not a violent person. Good post. Please visit http://www.bbc.co.uk/radio4/arts/afternoonplay.shtml and then click on play on Tuesday to listen to dramatisation of one of Mma Ramotswe’s cases. I’d rather pay people not to have tea with me! Gah- there I go, over estimating myself again. But then, guess it rubbed off from the swank-headed characters I seem to be reading all the time. Sigh… one of those days. Say, its a Monday today no? Heh, Mondays are like that only. BTW, you left an URL this time, and your blog is impressive – especially some of the 55-word shorts. Ammani, will check out the URL later today, I can’t listen to the clip at work for some reason. I would love to have bush tea with you!